The Syrian Hamster is the largest of the pet hamsters. It is normally between 15 to 20 cm long and can weigh between 150 to 200 grams. It is also the most common in pet shops and comes in various colours, patterns and hair types. If you watch the videos here you'll see a Syrian Hamster. You can get short haired, long haired (it is only the males that can get the very long coats, the females stay fluffy), satin coated (this is a very shiny coat), Rex coated (the coat is slightly curly with the whiskers around the nose curling forward instead of sticking straight out) or combinations of these. There are many colours commonly available including golden, cream, white, black, cinnamon, yellow, silver grey, dark grey, honey, sable etc. There are also other colours that might only be available from specialist breeders such as lilac, rust, smoke pearl, lilac pearl, silver black, melanistic yellow, dove etc. In any of the above you can get a coloured hamster with white spots or a coloured hamster with a white band around it's middle. In some colours you can also get a tortoiseshell, which is a coloured hamster with 'yellow' patches and also a tortoiseshell and white which is a tri-coloured animal (as with cats tortoiseshells are all females). As you can see there is a lot of choice when it comes to choosing your Syrian hamster! This hamster is only about 10 cm long and can be found in a number of colours, some of which may only be available from specialist breeders. Some of these colours are normal, argenté, albino, black, black eyed white, black eyed argenté, blue fawn, lilac, lilac fawn, opal, platinum and mottled (this being a coloured hamster with white spots. 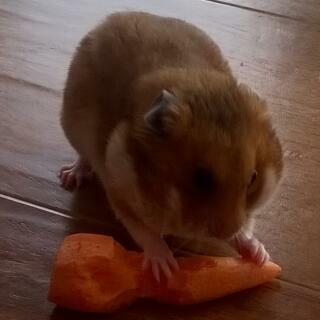 This hamster is a little smaller than the Campbell, being about 8 cm long. This variety only comes in 5 colours at the moment - Normal, sapphire, normal pearl, sapphire pearl and mottled. This is the smallest of the hamsters (about 5 cm long) and also the fastest - because of this, it is not an ideal pet for young children. They come in various colours, some of which are very new to the UK (2011) and so may not yet be available as pets. These colours include normal, husky (white faced), brown locus and pied. This hamster, although classed as a Dwarf, is part of the Rat-like hamsters and grows to about 12 cm long. It has a slightly longer tail than the other hamsters. There are only 2 colours available at this time - normal and the dominant spot, which is a coloured hamster with white spots. Lots of information on the topic and I will use this website for many things in school and out!